Table 34 at the Grand InterContinental Seoul is where a unique sense of style lives. In celebration of this style from December 5 to December 9 Michelin star chef Christian Etienne has been invited to share his unparalleled culinary talents with our patrons. The selected menu items will be available until the end of December (except Christmas Eve) even after the Chef leaves. Awarded the highest critical acclaim for his culinary creations with truffles ("black princesses"), herbs, garlic and tomatoes, Chef Etiennne has also been recognized by the Michelin guide. By holding ‘Le Festival Provençal', the hotel is celebrating the 120 years of successful collaboration between France & Korea. Already as a young boy in his native region, Provence, Christian Etienne was sure he would become a cook. At the Ritz, then at the InterContinental, Christian Etienne began honing his skills as cooker's help. He returned to the Ritz as sous-chef, where he broadened and deepened his knowledge, but he longed to return to his beloved Provence, and so he shortly went home to Avignon and opened his first restaurant where he shared his chef's expertise, magnifying the wealth of southern French cuisine. Within the space of a few years, his talent attracted the local folk, as well as connoisseurs passing through. He obtained his first star in the famous Michelin guide, and became a "Maître Cuisinier de France" - a Master Chef of France - a select group of recognized French chefs. It was at that point that he decided to offer to his guests one of the most beautiful palaces in Avignon. He installed his new restaurant in a historic monument next to the famous Palace of the Popes, a palace that had housed many historic personalities, a place of beauty quite fitting to his own warm welcome. 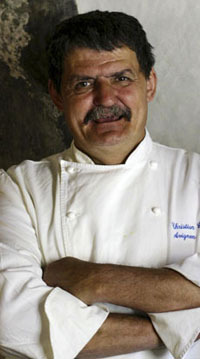 Also he wrote 5 recipe books which include "La Magie de l'huile d'Olive" introducing regional food using olive-oil, "La Magie de la Rabasse" showing us and proving to us that it is not so difficult to prepare these "black princesses" (Truffle) and to serve them with vegetables, seafood and white meats.